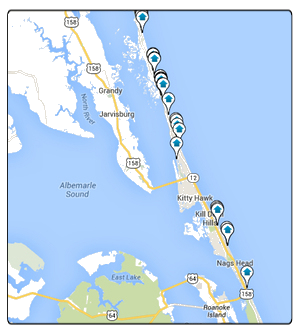 The first community you’ll find coming into the Outer Banks is called Kitty Hawk. If you are a boater you should check out the Kitty Hawk Landing area! Kitty Hawk’s downtown area is home to the biggest retailers on the Outer Banks, including Walmart and Home Depot, restaurants, shopping and entertainment. The homes for sale in Kitty Hawk currently start at right around $130k and can go as high as $2 million. If you would like to schedule a tour of one of the homes for sale in Kitty Hawk just give us a call!